I wanted to drop you a note to thank you for all the support you’ve given me — and the Susan G Komen Foundation — over the last 10 years. When I started taking part in the Breast Cancer 3-Day back in 2008, I had no idea whether this would be a one-year thing for me or whether I’d still be walking many years later. Obviously, I would have been delighted had some scientist looked up from a Petri dish at some point and gone “EUREKA!” … but unfortunately, movies and television aside, science doesn’t really work like that! In ten years I’ve walked in sixteen Susan G. Komen 3-Day walks and crewed in ten others. This coming weekend, in Atlanta, I’ll walk in my seventeenth. You can follow me at http://www.twitter.com/jayfurr, if you wish. In these ten years, thanks to you, I’ve raised somewhere on the order of $47,740. In other words, I’m coming up on $50,000 in ten years, which is a pretty amazing number and which I owe entirely to the generosity of friends and family and co-workers like yourselves. I know that everyone has priorities of their own and I’m so grateful that you’ve taken the time to support mine. We have made progress in the fight against breast cancer over the last ten years… but at the same time, we continue to lose those close to us. I’ve lost friends. I know some of you have also — friends, family members, loved ones. We all know the toll cancer can take. I can never thank you enough for all your support and caring. P.S. 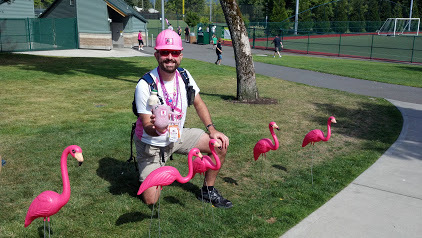 If you know of anyone who might also want to sponsor me, my donation link is http://www.the3day.org/goto/jayfurr.